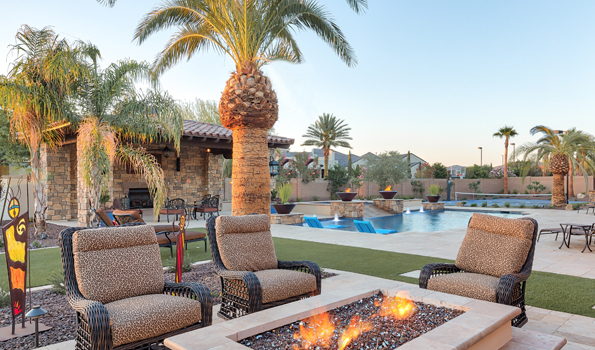 Even though Phoenix is touted as a “dry heat”, there are many months when it is really not comfortable to sit outside and enjoy your outdoor living space. And this might seem odd at first when you consider that we only have a few month of temperatures in excess of 100 degrees. And after all, our body temperature is less than 1.5 degrees below that 100 degree mark. However, the fact is that our bodies are constantly producing additional heat by movement of muscles, the electrical function of our nervous system and through biochemical reactions such as digesting food. This heat must be dissipated into the surrounding air by exhaling warmer humidified air and by evaporating sweat. But if the air is near our body temperature, then our natural cooling cannot effectively or efficiently function. Optimal air temperature for our bodies to cool is around 70 degrees. 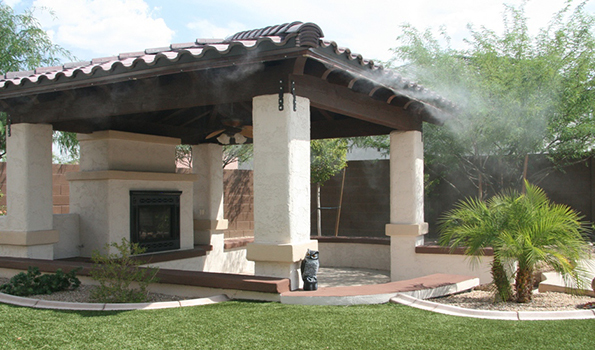 In lieu of being able to air condition the outdoors, a professional misting system is a great way to create a very pleasant and livable outdoor living space. But every homeowners first thought is the cost of the professional system when there are other less expensive options such as a DIY kit. There are two main components to a professional misting system that set it apart from the do it yourself kits from the local big box store, the pump and the nozzles. These are the two pieces of the system which have a huge impact on how well the entire system functions and how comfortable you will be when using your misting system. UNIQUE installs a professional quality Fogco pump on all misting systems. With over 25 years of experience building pumps, Fogco knows what works and how to build it to last. Over the quarter of a century that they have been refining the misting pump, they have discovered that water droplets need to be 5 microns in size, that is 5 millionths of a meter, to create a process known as flash evaporation. Without going into a long explanation of thermodynamic principles, we will cut right to what this means for the homeowner sitting on the patio. Flash evaporation can and does lower the temperature in an area by up to 40 degrees without a noticeable increase in the humidity level. So the Fogco system will really cool your patio and not just transform it from a hot dry space in Phoenix to one that feels like a hot moist space in Miami. But to achieve this process the pump must function at around 1000 PSI which is not something that any DIY pump can muster. The other critical piece of the system is the mister nozzle. Not only does the nozzle need to be able to withstand the 1000 PSI that the pump is exerting but the nozzle also needs to be constructed of high quality materials which are designed to create this fine mist. High quality nozzles are much more than just a piece of metal with a tiny hole in the center. The nozzle needs to have an anti-drip assembly which will prevent those puddles on the patio that can be a slipping hazard and an annoyance. And they need to be able to be disassembled so that they can be cleaned. The incredibly small openings in these nozzles can become clogged by the tiniest of particles considering that 5 microns is just slightly smaller than the 8 micron size of a human red blood cell. 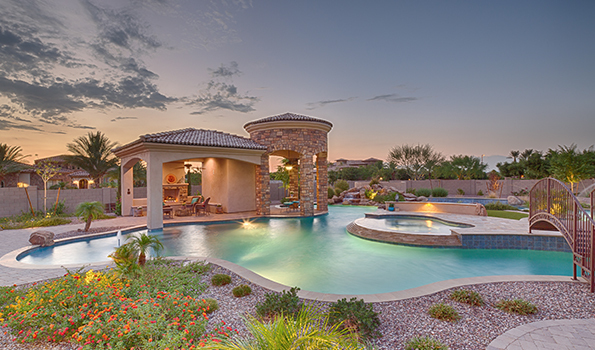 So you have two choices when you decide it is time to add a mister system to your Phoenix outdoor living space. You can head to the big box store, spend a few hundred dollars and a weekend installing the system only to be damp and still uncomfortably hot. Then most likely you will call the UNIQUE Company to install your custom professional misting system. You can save the time and frustration of trying to conquer physics and thermodynamics for under $200 and you can call the UNIQUE Company to install your custom professional misting system.